Job of a physician assistant is a perfect springboard for your career of a healthcare practitioner. You will learn the basics under the guided supervision of an experienced physician, and get ready to start your own medical practice. But how to get this job in an interview? What questions will they ask you? And how to make a good impression on the people in the hiring committee? We will have a look at the topic in this article. Personal preferences matter a lot in this case–you are probably already aware of it. The physicians spend a lot time with their assistants, and they will not hire you unless they feel good with you. It is something natural, and you should keep it on your mind while interviewing for this job. What does it mean in practice? You should definitely try to be nice, you should show respect and recognition for their work and their medical practice. Do not talk only about yourself, your studies and skills. Talk also about them–their practice, their goals, their life. Find out as much as you can about the doctor and their practice. The knowledge will help you to answer some questions, but it will also help you to discover things you can praise them for. If you apply for a job at a clinic, and will work with different doctors during the day, you should focus on the healthcare institution in your research. What do they specialize in? How do they work? What is their reputation in a local community? What do patients say about them? Check the industry news. The physician can, and also want to, learn something from their assistants. Show them that you have some knowledge of the latest trends, that you can actually bring some value to their practice. Why do you want to work in our practice, and not in another place? You have a few options here. Either you can focus on the convenience of the job, saying that you have a good traffic connection with the place, that the working hours suit your daily schedule. Another option is to praise them for something they do better than their competitors (or perhaps worse), and claim it as the reason for your choice. One way or another, they should have a feeling that you really want to work for them, and chose them on purpose. What characterize a good physician assistant in your view? You can again approach this questions from various angles. One of them is mentioning working duties, one by one, and emphasizing that a good PA is able to take care of each of these duties. Another, more holistic approach, is saying that a good physician assistant has a close and smooth cooperation with the physician, and that they deliver an excellent service to the patients. How do you imagine a typical day in work, if we hire you. Job description will help you to understand what you will do. You can list the duties, or you can come up with your own idea of a working day. The key is to show them that you expect to be busy in work, and to always have something to do. Do not talk about coffee breaks or a tasty lunch–of course you will enjoy these little pleasures, but you should focus on your working duties while talking about a typical day in work. From your point of view, what are the main duties of the physician assistant? 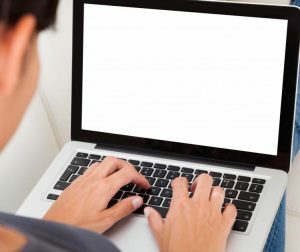 Working as a member of the health care team, taking medical histories, examining and treating patients, ordering and interpreting laboratory tests and X-rays, making diagnoses, and prescribing medications, the PAs do more less the same things as the physicians do–just they do it under a supervision of someone more experienced. Have you any experience with prescribing medication, surgery assistance, or conducting physical exams? Try to speak nicely about your experience, show some enthusiasm. Tell them that you enjoy doing what doctors do, that you understand the meaningful purpose of your work, and are not afraid of any common task. And if you haven’t done anything yet, tell them that you are eager to learn, and after all the theoretical studies and careful observation of other physicians in work, you can’t wait to finally put your hands to the test. Where do you see your career heading in the future? You can talk about your specialization in medicine, or perhaps even about an idea of starting your own practice one day. The key is to show them that you plan to stay in healthcare, and want to pursue your career in this field. How would you deal with an angry patient? Angry, sad, happy, scared. You will meet people in all kinds of mental conditions while working as a healthcare practitioner. Show the interviewers that you are ready for it, that you understand the emotions patients experience, and will approach every person with understanding and respect. You can also say that you try your best to not be affected by the bad behavior of some patients. Do you prefer to give orders, or to take them? You should say that you have no problems with both, but emphasize that you understand your position, and will respect the orders of the leading physician. On the other hand, you will often instruct patients, and even other medical personnel (think medical receptionists, nurses, medical assistants) on what they should do. Therefor you should be ready to give orders as well. Describe a conflict you had with the colleague (classmate, teacher), and how you (or other person) solved the conflict. A difficult behavioral question. Try to talk about a situation that had a happy ending, a conflict you managed to solve. Show the interviewers that you always try to understand the perspective of another person, and are open to constructive criticism. 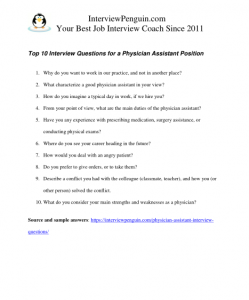 Acing an interview for a physician assistant job is not easy. Continue your interview preparation, learn more, and ensure you will do everything right on the big day. Body language in an interview – What do your gestures and movements say about you? Can we control our non-verbal communication? Interesting post that will help you to understand the basics of non-verbal communication in an interview. Interview Success Package – Brilliant answers to thirty most common interview questions, and a simple guide on how to impress your interviewers. All you need to know to ace your job interview.